Yesterday I went for a cleaning and check up at the dentist. See, I told you I'd go back and get on top of things. I seemed to have clicked with this office, which to me is more important that what tier they are under our insurance. I'm willing to pay a little more if I feel comfortable there. I got all the tarter scraped off my teeth, which was pretty hard since it had been a while. She also polished and flossed my teeth as well as took x-rays. The dentist and hygienist both were happy with how my teeth, gums, and bone structure looked for someone who hadn't been to the dentist in a while who also has diabetes. 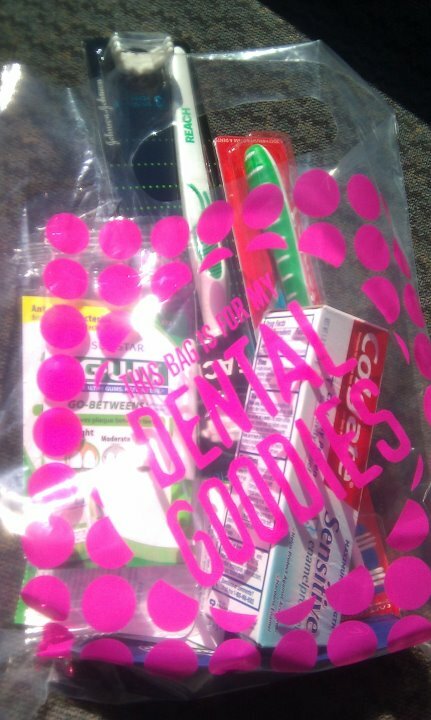 I even got a bag full of goodies! I get to go back in a little over a week for the first couple fillings. Although I'm obviously not excited about it, I am looking forward to getting this work done and being pain-free. I'm proud of myself for setting up my next cleaning in March already. I'm also getting better at brushing and flossing how I should vs. when I remember. (Remember that I already admitted to not being the model diabetic.) Hopefully in the next few months I'll be totally done (should take about three appointments) and move on to other things. Finding my "Place in This World"
Fill in the _______. Finding humor in diabetes.